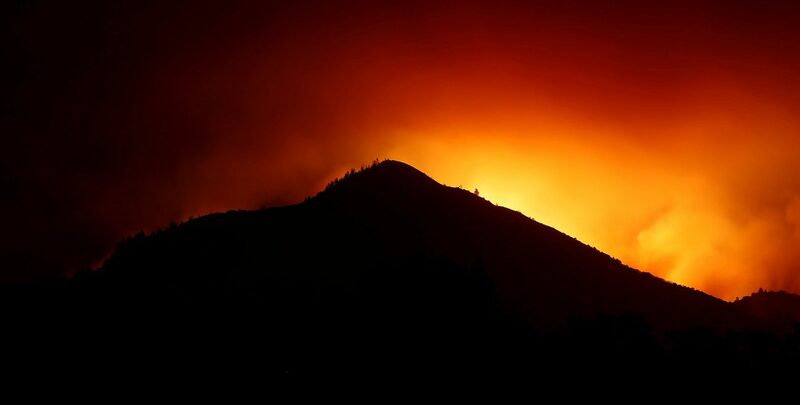 SANTA ROSA, Calif. (CNS) — The Diocese of Santa Rosa “has been hit hard” and “is in an ongoing state of uncertainty” because of Northern California wildfires that began the night of Oct. 8, said Bishop Robert F. Vasa. Fanned by warm winds, they devastated a vast swath of North California’s wine country and forced 20,000 to evacuate. The fires left at least 31 people dead, and hundreds of others were missing. News reports said that 21 fires spanned 300 square miles and that as of late Oct. 12, most were zero percent contained. In Southern California, a destructive wildfire broke out in the Anaheim Hills. By Oct. 12, it was 65 percent contained. However, fire weather warnings remained in effect for Los Angeles, Santa Barbara and Ventura counties. In an Oct. 13 telegram to two California archbishops, Cardinal Pietro Parolin, Vatican secretary of state, conveyed Pope Francis’ “heartfelt solidarity and his prayers” for all affected by the disaster, especially those mourning the loss of loved ones and residents “who fear for the lives of those still missing. The cardinal added the pontiff sent his blessing to all and offered encouragement to local civil authorities and emergency personnel assisting fire victims. The message was sent to San Francisco Archbishop Salvatore J. Cordileone, in Northern California, and Los Angeles Archbishop Jose H. Gomez, in Southern California.